Yesterday I posted our citrus seasoning rub recipe and starting technique for our turkey. It came out deliciously; very moist and just a hint of flavor from the rub. 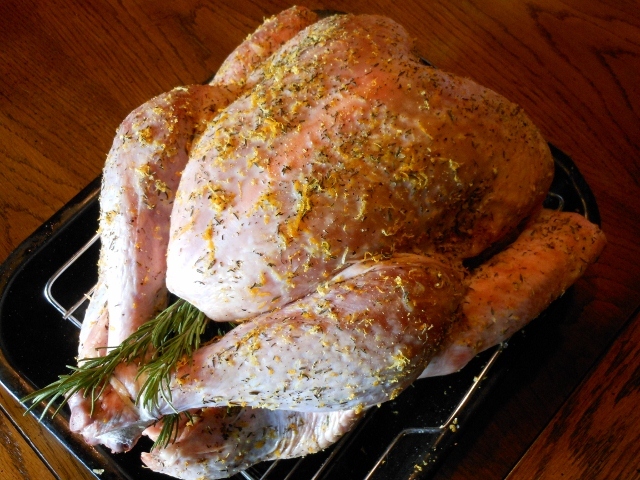 Start the night before; make citrus seasoning and rub all over dry turkey. Refrigerate turkey uncovered overnight. Remove from refrigerator 1 hour before baking. Heat oven to 425 degrees. Sprinkle a bit of paprika on turkey and if desired place some rosemary sprigs, a quartered onion half and a lemon sliced in half inside the cavity. Place turkey in oven; reduce temperature to 375 degrees. Begin baking for 25 minutes. Meanwhile combine apple cider, orange and lemon juice, butter, and paprika; bring to a simmer and remove from heat. 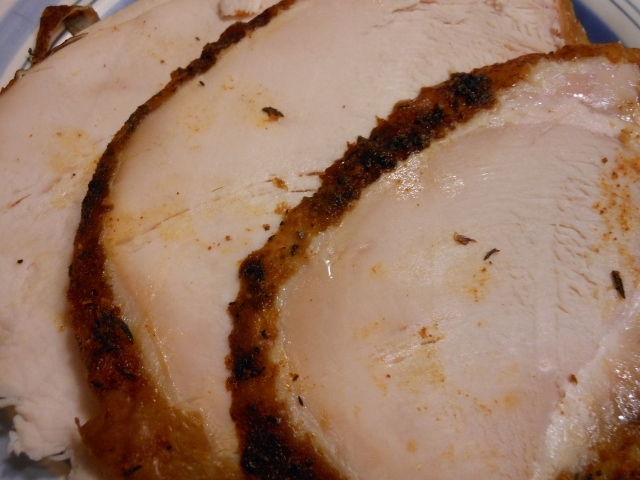 Baste turkey after 25 minutes; continuing to baste every 25 minutes or until turkey is done. Cover with foil when skin starts to brown; I think we’d cooked about 50 minutes when we covered ours. We roasted ours about 3 1/4 hours which was right in line with the recommended times from one of my trusted cookbooks; others suggested it would be ready as quickly as 2 – 2 1/2 hours. You’d be looking for 165 degrees in the thigh area and clear juices. 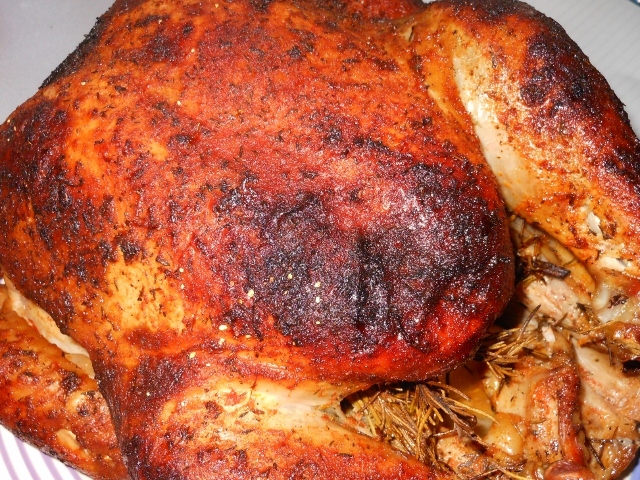 Try to let it rest for 30 minutes before carving; this helps to ensure a juicy bird! This entry was posted in Entrees, Recipes, Techniques and tagged baked, citrus rub, dinner, food, orange and lemon, recipe, recipes, roasted, rosemary sprigs, thanksgiving, turkey. Bookmark the permalink.